THIS COURSE IS FOR NEVADA RESIDENTS ONLY. Please call 775-857-4958 for information. These classes are presented by TMCC's Safety Center. 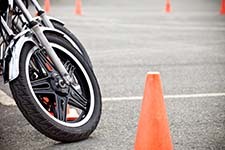 Visit our Facebook page: TMCC Motorcycle Safety. READ YOUR CLASS CONFIRMATION EMAIL TO SEE THE ACTUAL LOCATION OF YOUR CLASS--NO MOTORCYCLE CLASSES ARE HELD AT TMCC'S MEADOWOOD CENTER. To find earliest class please sort by date in the box below. If you are under the age of 18 you must complete the Motorcycle Safety waiver that is linked under the class description. Please bring this form with you to class. When registering be sure to use your name as printed on your driver's license. Like us on Facebook and get more information on the TMCC Motorcycle Program. Schedule : Multiple Class Schedules: Weekly - Fri 5:30 PM - 9:30 PM; starting 4/19/2019, ending 4/19/2019. Schedule : Multiple Class Schedules: Weekly - Fri 5:30 PM - 9:30 PM; starting 4/26/2019, ending 4/26/2019. Schedule : Multiple Class Schedules: Weekly - Fri 5:30 PM - 9:30 PM; starting 5/3/2019, ending 5/3/2019. Schedule : Multiple Class Schedules: Weekly - Fri 7:00 AM - 5:00 PM; starting 5/10/2019, ending 5/10/2019. Schedule : Multiple Class Schedules: Weekly - Fri 5:30 PM - 9:30 PM; starting 5/10/2019, ending 5/10/2019. Schedule : Multiple Class Schedules: Weekly - Fri 5:30 PM - 9:30 PM; starting 5/17/2019, ending 5/17/2019. Schedule : Multiple Class Schedules: Weekly - Fri 5:30 PM - 9:30 PM; starting 5/31/2019, ending 5/31/2019. Schedule : Multiple Class Schedules: Weekly - Fri 5:30 PM - 9:30 PM; starting 6/7/2019, ending 6/7/2019. Schedule : Multiple Class Schedules: Weekly - Fri 5:30 PM - 9:30 PM; starting 6/14/2019, ending 6/14/2019. Schedule : Multiple Class Schedules: Weekly - Fri 5:30 PM - 9:30 PM; starting 6/21/2019, ending 6/21/2019.